Dr Liz... the vet from Russell Vale Animal Clinic: Hidden Disease in a Pet's Mouth - the not so routine "dental"
Hidden Disease in a Pet's Mouth - the not so routine "dental"
Dr Liz's Dental Talk aka Discussion, will be all about a very important fact that many people often forget - Dental disease can hide in a healthy looking pet's mouth. The only thing hiding here are the toothbrushes! 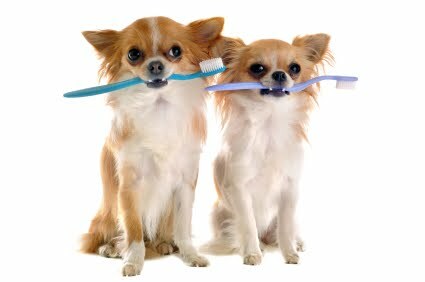 Dental disease is common in our pets, yet there are many pet owners who look in their pet's mouths, and say to themselves (and sometimes to me), "my pet's teeth look great". Let us meet Micky, a 9 YO terrier, who came to see me for the first time recently. Micky and his family was on holiday in Wollongong when he was due for his "annual teeth cleaning". His owners, after doing the internet searching, and visiting several vets locally, including taking advantage of our "free dental check" booked him in with us to have his "dental". What a brave boy he was that day .... I never underestimate what a big thing it is for your pet to have an anesthetic for their mouth to be assessed and treated. It is never "another day at the office" for us, as we are dealing with very important members of your family. And there is definitely nothing routine about the "dental", as we try to identify disease that often remains hidden in a pet's mouth. Micky's general examination was otherwise not too bad, but we did see that he did have discoloration on two of his upper incisors and some tartar build up on his back teeth. After his sedation, placement of an intravenous catheter, and whilst he was under anaesthetic a full dental assessment was done, a dental chart created, and dental xrays taken. On visual inspection, his mouth looked like this. If you can spot the disease, then show me. Visually, this part didn't look to bad to me at all. He did have some tartar though on his back teeth. During his charting, when we placed a probe around each of his teeth (please note that dogs have 42 teeth), we found some abnormalities. We found that he had some periodontal pockets (the probe went in deeper than it should've), which we knew would need a more thorough cleaning and treatment. We also found two incisors which were "mobile". Why not look at the video to see the "wobbliness". Mobility of teeth raises a big question - is it loose because the tooth is broken? is it because there is bone loss? perhaps there is soft cancerous tissue around it? His xray could've looked like this. But, it didn't. The xray above is from another patient that had a similarly mobile tooth, but with radiographs, were were able to identify the problem - ie it was fractured, and also had a tooth root next to it (but there was no visible crown). In this case, we extracted both teeth fragments successfully and completely. Mickey's dental Xray looked like this! The four incisors in the middle needed to be extracted - there was nothing that would salvage them, and to leave them would cause Micky ongoing pain. Also don't forget that it was only one tooth that was mobile, so if we had just extracted that, based on probing alone, Mickey still would've been in pain as a result of the other diseased teeth. At this point in time I should add - There is a rule that is sacrosanct with us - we do not perform any extractions without the owner's permission. You can say "do what you need to do, I trust you", and I do really appreciate it when you say that. But unless we can get hold of you, and get your permission, we will not do anything unless we had discussed it with you. In my view, you are integral to any decision that needs to be made. So, I start to clean Micky's teeth. My vet nurse Dirk jumps on the phone to update Micky's owner. We get permission to extract the four upper incisors. We are thankful that the owner trusted us enough to do that as we had not anticipated any extractions to be necessary (given his regular "dentals") and his visual examination. This isn't Mickey either, but it it shows our set up. After the extraction, we always curette out the socket well, and then flush. With Micky, we kept samples of this tissue to submit for histopathology, if it was needed. After the sutures are placed, Micky woke up uneventfully, and went home later that afternoon. All of our patients who undergo dental procedures with us, go home with a copy of all of the xrays, the dental chart and a home care pack. Getting the teeth cleaned and healthy under an anaesthetic is big part of what needs to be done to keep teeth and gums healthy, but it isn't the only part. Ongoing work needs to be done by you, the pet owner. At his two week post dental check, he was great, and his mouth looked awesome. And of course, a very happy owner. Well, that is a bit of a lie. She wasn't 100% happy. She had alot of questions that I could not answer. "How long was it like that" "Was he in pain all of this time" Let us not forget that this was the first time Micky had a dental procedure with us, and the first time he had dental xrays, but it was not the first time he had a "dental". So next time I look in a pet's mouth, and I think it "looks OK", I'll remember Micky (and I hope you do to when you look in your pet's mouth). Dental disease likes to hide, and it is only a full assessment under an anaesthetic, a thorough dental examination, and with the help of dental xrays, can the true extent of disease be identified and treated. It saddens me to think that there are pet's out there who are getting tartar scraped off at home, at a groomers, or even in a vet hospital, and the true disease is missed. We thank all of our loving pet owners who trust in us at Russell Vale Animal Clinic to do the right thing for their pet. If you ever feel there is disease in your pet's mouth, or if your pet's breath smells, give us a call. I am Dr Liz, the mad vet of Russell Vale Animal Clinic. We have been offering and doing intra-oral (dental) Xrays since 2005 (the first in the Illawarra) , and went digital in 2009. We are experienced in identifying and removing tooth root fragments, unerupted teeth, and identifying the problem tooth when a tooth root abscess is diagnosed (it isn't always the tooth we think it is). Any questions, do not hesitate to call us on 02 42 845988, or comment below, or send us an email. Don't forget that we have free dental checks all year round (we do not wait for Pet Dental Month), so we are always happy to "Flip the Lip" for you (by appointment always).